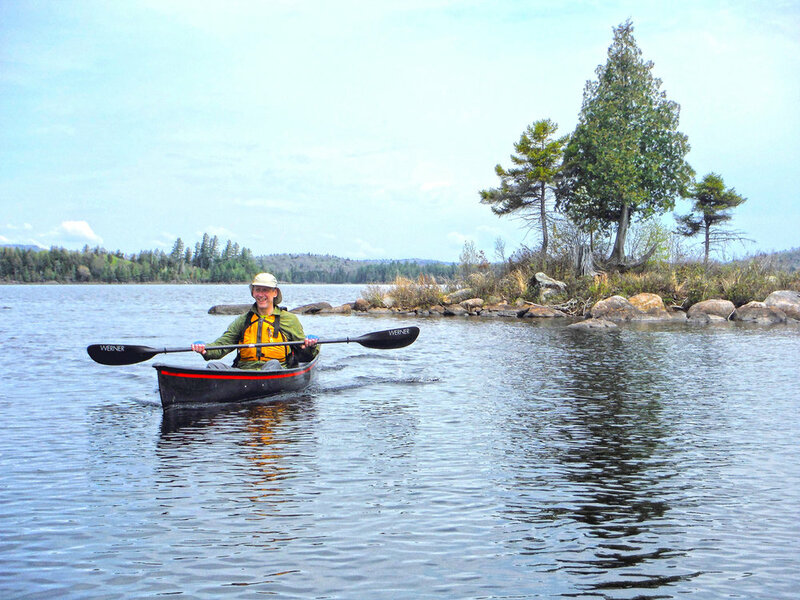 If you like sandy beaches, clear water, observing wildlife, colorful sunrises and sunsets, and peaceful motorless places then you should love Little Tupper Lake. Located in the west-central Adirondacks, Little Tupper and nearby Round Lake and Rock Pond are great destinations for the day paddler as well as the overnighter. Little Tupper is six miles long and at 2,300 acres, it is the 14th biggest lake in the Adirondack Park. Behind Lows Lake, it is the second biggest lake that is essentially motor-free. Its 20 miles of shoreline offer much to explore. There are 24 designated primitive paddle-in campsites available on a first-come, first-served basis. The put-in is south of Sabattis Road in the town of Long Lake. You might be surprised to see so many buildings here – once the headquarters of Whitney Industries, these buildings are now utilized as a ranger station and summer housing for AmeriCorps interns. Next to the parking area are restrooms and a spot to fill up with drinking water – fairly deluxe amenities compared to what is generally expected in the Adirondacks. You do need to carry boats and gear about 100 yards to get to the sandy beach next to a boathouse. There are two private estates nearby. Camp Francis is west of the put-in. The other, Camp on the Point, is seen to the east, along the south shore. As you paddle west you travel away from civilization and into the wilderness, the William C. Whitney Wilderness to be exact. From the put-in, you have to paddle around a point and through some grassy shallows. Little Tupper is not very deep and moderate winds, especially winds from the west and southwest, can produce waves of over a foot. The point can block the wind and I’ve watched folks head out from shore on a relatively calm surface, and despite paddling hard, come to a standstill once they rounded the point and faced the headwind – check the wind forecast before heading out. Early morning is usually the calmest time to paddle. Paddling along the north shore, you soon pass Camp Francis and campsite #1 is reached on state land about one-mile from the put-in. After rounding the point and heading north you pass campsite #2 and find the mouth of the outlet of Otter Pond. You can make it up this twisty stream about a mile and reach the Burn Road foot trail (aka Lilypad Pond Trail) before having to turn around and head back to the lake. Back to Little Tupper we head past an island and campsite #3. Campsite #6 is high up in the pines on the next rocky point. After passing site #7 there is a good-sized bay and sandy beaches become more prevalent – day-trippers may want to stop somewhere past site #9 for a swim or a picnic lunch. Site #12 is the last campsite along the north shore; it is over four miles from the put-in. To the west is a low wetland through which the outlet of Charley Pond winds before reaching the lake. 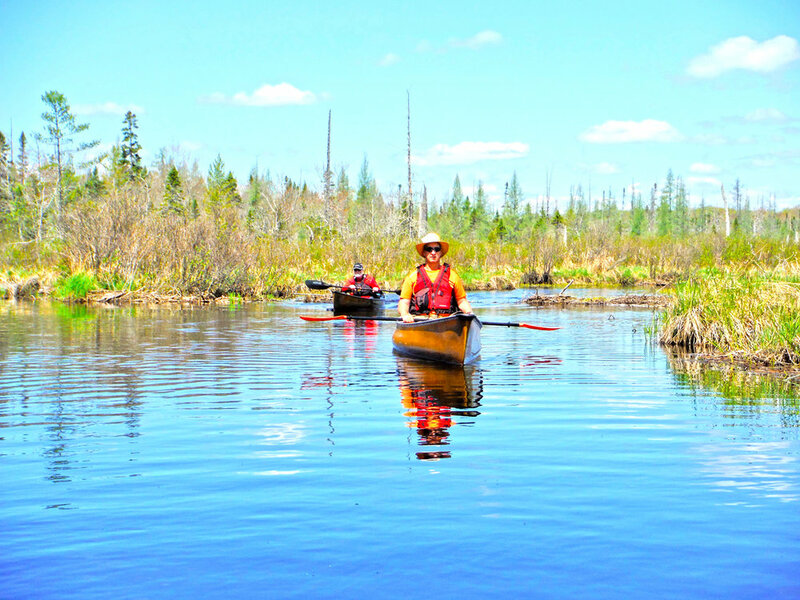 Paddle upstream and you will soon reach the Burn Road Trail bridge, which blocks the way – not the easiest place to get out, but if you portage around it you can continue paddling further upstream for less than a mile before reaching private land. A walk along the Burn Road Trail will show you how a not-so-old logging road is growing in after a span of 20 years. Keep an eye out for snapping turtles while paddling back to the lake. South of Charley Pond Stream is an unnumbered campsite called Camp Bliss. This was originally the site of a four-bedroom cottage used by the Whitney family, and a guest cottage was 150 feet to the north. I visited right after the state bought the land in 1998, but soon after my visit the buildings were removed. It is now a somewhat buggy open area, but from the beach it does have a great view up the lake, so it is worth a stop. Southeast of Camp Bliss is the mouth of Rock Pond Outlet – 1.5 miles of fairly wide, gently-winding stream with boggy shores. Depending on the season look for flowering leatherleaf, sheep laurel and pickerelweed. Pond lilies add more color in summer and swamp maples turn bright red in late summer. There are two campsites on Rock Pond Outlet, #23 is on the right and a bit further #24 is on the left. The outlet of Bum Pond enters from the west; I’ve only gone up it about a quarter-mile but you can go further. Look for cranberries here late in the season. Continuing south on Rock Pond Outlet, there is usually a good-sized beaver dam that will require you to get out and pull over. Soon after, you reach some rocky rapids and the 100-yard carry to Rock Pond starts on your left. I always admire the huge white pine that grows a short distance up the carry. You can get back in the water at a dilapidated bridge. The channel soon widens and you are in 282-acre Rock Pond, a wonderfully remote body of water. The resident osprey often guard the entrance to the pond, so they may sound a bit perturbed at your presence, calling ‘tewp-tewp-tewp’ until you are well past their nest. Rock Pond has a total of six campsites. Heading south on the pond, you soon pass the rocky point of site #25. South of #26 is a nice rock island good for lunch and/or a swim. The carry trail to Hardigan Pond starts nearby. Number 28 is on an island in the middle of the pond. An inlet that enters the east end of the pond is navigable to private land, still owned by the Whitney family – in here, I once spied a doe and fawn hiding in the tall grasses. Back to Little Tupper Lake and turning northeast we soon pass Short Island, the biggest island on the lake, with two campsites. Then comes a small rocky island upon which at least one romantic marriage proposal has been made – and accepted. There are more islands to the northeast, two have campsites; one has a rock landing, the other a small sand beach. Loons seem to like this area. You can watch them but please resist the temptation to get a closer look. Site #22 is on an island close to the south shore. There is a narrow passage between the island and the mainland; just paddle slowly and watch out for shallow rocks as you pass through. I’ve been entertained near here by three otters poking their heads up out of the water and snorting at me. Eagle Point is another unnumbered campsite with a nice sandy beach. It is the easternmost of all the campsites making it fairly easy to reach from the put-in. Camp on the Point is quite visible from here. It is over a mile to private land and Camp on the Point. A bit on the ostentatious side of things, the building sticks out like a sore thumb because of its light beige color and lack of screen of trees at water’s edge. If I had my way, all buildings in the Adirondacks would be green and brown to blend in with the surroundings. Bog Stream enters the far eastern end of the lake. I am told that this is navigable for at least three miles upstream, but it is all in private land. Look for the fire tower on Buck Mountain to the southeast. Turning west along the north shore you soon see the start of the mile-long channel to 740 acre Round Lake, another wonderful destination that is worth its own trip. This channel passes under the Sabattis Road bridge. From here it is only about a mile past some sandy beaches back to the put-in. In addition to the wildlife mentioned, you are likely to see and hear beaver, white-throated sparrows, kingfishers, common mergansers, bald eagles and gulls. I once witnessed a gull chase an osprey over the water but it backed off when two more osprey flew in to help out. Black bears, moose (I’ve seen one on the drive in), and bitterns are around too but not often seen. Camping in the William C. Whitney Wilderness – Contact the local Forest Ranger for a permit prior to your arrival if you plan to stay at the same campsite for over three nights. Overnight group sizes of eight people or less using no more than three tents are allowed at all tent sites. Most campsites have a fire ring and pit privy. Fishing – Little Tupper Lake and Rock Pond are the home waters of a unique “heritage” strain of brook trout known as the Little Tupper strain. Largemouth bass are now in these waters and have had a negative impact on the brook trout population. Only artificial lures may be used and all brook trout caught must be immediately returned to the water alive. Maps – The Adirondack Paddler’s Map: North and Adirondack Paddler’s Map: Whitney Wilderness (available early this summer) show campsites, trails and state land – available at St. Regis Canoe Outfitters (canoeoutfitters.com) or your local outfitter or bookstore. You can also find more info and a map of the William C. Whitney Wilderness on the NYS DEC website (dec.ny.gov). A lover of wild places, Rich Macha (adkpaddle@yahoo.com) of Schenectady has led many trips for the Adirondack Mountain Club and has spent 20 years in the paddlesport business.